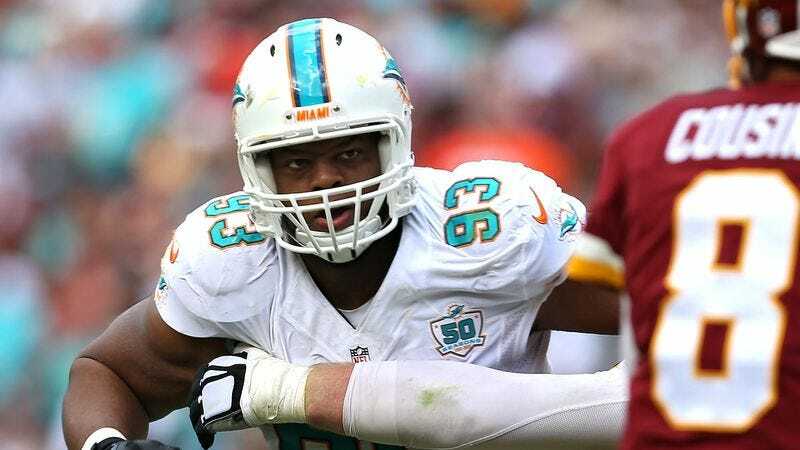 MIAMI—With the star defensive tackle struggling considerably in the first two weeks of the season, Miami Dolphins coaches told reporters Wednesday that they have been working closely with Ndamukong Suh to fix his quarterback-throwing mechanics. “Watching tape of him the past couple weeks, we’ve noticed Ndamukong hasn’t had his usual strength and accuracy, so we’re working with him to get back to the fundamentals of throwing the quarterback,” said Dolphins defensive coordinator Kevin Coyle, adding that Suh has had trouble with his release, often using an elongated sidearm motion that causes him to badly underthrow the quarterback downward and into the ground. “One of the big things we’re focusing on is his footwork, which has been pretty sloppy. We need him firmly planting his feet so he can really step into the throw, which will help put a lot more zip and distance on the quarterback.” Team sources later confirmed that Dolphins coaches were pleased after Suh precisely set his feet, extended his arm all the way in a crisp follow-through, and tossed practice squad quarterback Logan Thomas in a perfect spiral into the end zone.